I have some amazingly creative friends. I find surrounding myself with like minded people is really helpful especially when I am feeling less creative. Everyone goes through those slumps and I felt a bit in one over the past few months. However, now with the sun shining and Spring definitely here I feel rejuvenated. I am so thankful for the people who continue to read my blog and follow my social media presence. With such hectic lives I know it’s hard to be there for everyone in your life so I am really grateful to have such a supportive community. I know that I am writing less and less and it is something I’m working on but working two jobs and still trying to enjoy myself and have a relationship can be taxing at times. If you have noticed my posts are a little bit longer now and I’m talking more about my life rather than fashion. I feel like I want my blog to be a little bit more about me and less about what I’m wearing on a weekly basis. Plus shooting outfits every week doesn’t always work. I hope you like where the blog is going as I continue to find my words in this crazy, busy world! As some of you saw on my social media over the past month my friend Elyse had a solo exhibition, Space Probe, for her sci-fi collages at the Fifty-Fifty Arts Collective in Victoria. She kindly asked me to make my ‘famous’ sugar cookies, also known as her favourite baked foods of mine and I jumped at the opportunity. I love baking but for a special occasion is definitely my favourite. 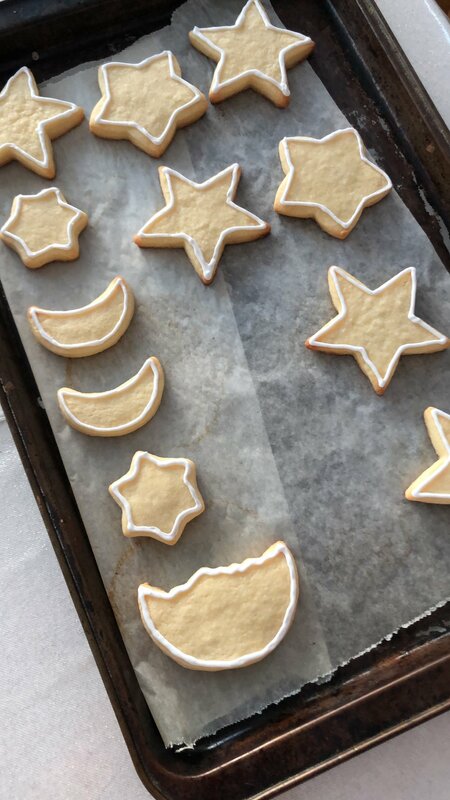 As the theme behind her pieces was space and sci-fi I decided I had to make space themed cookies. I used my favourite sugar cookie recipe that never fails me and flooded the cookies with royal icing. I doubled the batch and it was quite the endeavour but it was well worth it. Everyone really enjoyed the cookies and they accompanied the pieces perfectly I thought! It was so fun to come out with different colours and flooding techniques with a sprinkle of sprinkles on some! My mum was a huge help when making these so thank you to her! My display at the art exhibition, the napkins matched perfectly! The opening for the exhibition was on a Friday night. One of our mutual friends Nic, a local musician, serenaded us with some wonderful covers and even some space-themed tunes. Everyone mingled while drinking wine and beer and eating my treats. Elyse’s pieces were larger then life. The exhibition space was simple and perfect to show off her work and I am so proud to see her grow in her artistic career. It is so inspirational for me personally as I try to grown in my own career path. As I mentioned earlier I am crazy busy, some days I work for 10 hours straight but it is worth it. Some days I do think it would be easier to get a higher paying job and just work 40 hours a week and call it. However, I know I wouldn’t feel fulfilled and people like Elyse and my best friend Dani in Toronto inspire to keep doing what I love, so I am! All different space themed treats! This summer I would really like to try and get my name out more with baking. Maybe do a market or two. I think it would be a good way for me to realize if opening my own bakery one day is something I could do and enjoy. It’s a dream of mine but it’s a difficult one especially at this age when I’m thinking about settling down, buying a house and doing all those adult things. Dave has been so supportive of me and he’s been working very hard on his sourdough recipe and technique. It would be really fun if the two of us could do something together for the market and eventually a bakery or cafe so we shall see. For now if you ever want anything specially made for an event I’m your girl! Or come and find me at Quince and try some of my freshly made baking!